Conifer Lodge is 3 large Edwardian houses situated in a highly sought after residential area, with only a few minutes’ walk from a wide range of local amenities, including a well-established shopping area offering most shops, a post office, numerous coffee shops and tea rooms. There is also a library and an adult learning centre within walking distance. Conifer Lodge is a home for up to 26 residents, tastefully decorated and comfortably furnished yet retaining much of the character you would expect from Edwardian Houses. The registered manager of Conifer Lodge is Josephine Lowe and she is supported by senior carers and a team of care and support staff. Care staff are on duty 24 hours a day. There is also a team of ancillary staff who ensure Conifer Lodge is maintained to the very best standard of tidiness and cleanliness. The well-kept sea fronts, and Hove Museum offering different exhibitions, are only a short walk away. Conifer Lodge is recognized for its quiet and peaceful location yet we are only a few minutes from the main bypass and we are easily accessible by car. Resident’s bedrooms are located over 3 floors, all with en-suite facilities and mostly accessible by stair lifts. Residents are encouraged to bring small personal items with them to add that familiar touch to their surroundings. Small items of furniture are also acceptable, as long as space permits. We have two lounges where residents can socialize, read a newspaper, look out on to the garden or watch television. 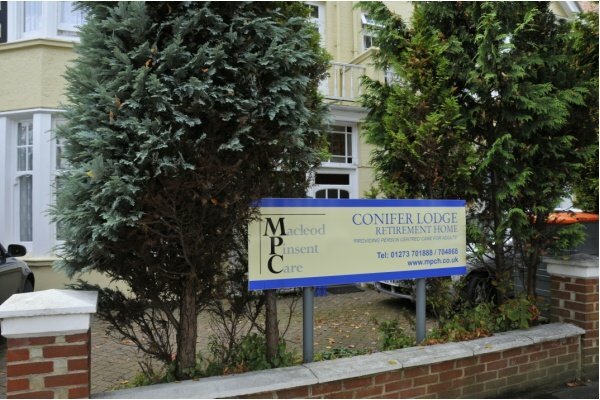 A varied daily in house entertainment program is offered at Conifer Lodge which includes general knowledge quizzes, bingo, poetry recitals, reminiscence sessions and various musical entertainers. Excursions to local areas of interest and beauty are arranged as often as possible, or alternatively a lunch outing to a local public house or restaurant. Residents meetings are held four times a year where we welcome suggestions and discuss forthcoming events. The home aims to ensure that the continuing religious interests of individual residents, are provided for, and we will endeavour to assist where necessary by providing support or transport to church services etc. Our Cook has been with us for 10 years and promotes home cooking and baking. We have been awarded the ‘Brighton and Hove’ Healthy Choice Award since it commenced in 2011. All meals are served in our large dining room; however should you wish to take all or some of your meals either in the lounge or in the comfort of your own bedroom we will endeavour to accommodate this. There is a small dining room available for private use should you wish to enjoy a meal with a family member or friend or celebrate a special occasion.